We are halfway through my month long effort to feature ways to shop local. Today I am featuring Kandyse of Blue Fox Glass. You shop in person with her and other artisans today at the Vancouver Farmers' Market this weekend. 9-4 Saturday & Sunday at the downtown Hilton. her work can als be found at Artistic Portland and Passion Vine. Kandyse began developing her art in the early 90s after taking a stained glass class. She purchased her first glass kiln in the fall of 2009 and became "addicted" to fused glass. She now works almost exclusively in fused glass, sharing her pieces in various art shows, festivals, and retail locations. Each piece of glass she uses is hand selected and purchased directly from the manufacturer in Portland, OR.You can see much more of her artwork on her website and her Facebook page. Another fun artist you will find today and tomorrow at Winterfest in Gig Harbor is Inky Quills. According to proprietress Chris Parkinson, "Inky Quills LLC has a great enthusiasm for the brilliance of human creativity, the glory of our natural world, and so much reverence for both that we pour our energy into the creation of handcrafted products that inspire and fulfill practical, healthy needs without severely impacting our customer’s pocketbook. We specialize in all natural, eco-friendly soaps and skin care products in a wide array of scents. We are always adding to our product line and we also do custom orders." Chris makes her soaps using avocado, hempseed, and olive oils. Also offered are lip balms and lotion bars. You can see a partial listing of products and make a purchase on their website. You will find Inky Quills LLC at the Saturday Poulsbo and Thursday night Bremerton Farmers markets. Releasing this week at Winterfest, is their new Little Bird line. These soaps are the same formula as their signature soap line, but they come in fun shapes and are colored with natural colorants. Check out their Facebook page for a fun set of photos showing the soap making process! There are so many options to keep your hard earned money you spend on holiday gifts local. One of those options happens this weekend, Winterfest at Peninsula High School in Gig Harbor. Funds raised from the nominal admission go to support school programs. Check you local newspaper or Craigs list for listings of local bazaars that support good causes. You will find me in space #45, in a corner of the main gym. See the following pictures to see all the new Ocean Jasper, Agate and Amethyst necklaces I will have. Meredith of Picket Fence Designs in Poulsbo, Wa creates a variety of totes and bags using oil cloth and laminated cotton. Picket Fence Designs was born from a love of crafts. Meredith has always enjoyed paper crafts and the designs on the papers, and she loves vintage. So when she saw rolls of oil cloth she new she wanted to make something out of it! The shop she bought the fabric from had tote bags so that was it. Oil cloth reminded her of the 40's & 50's when people would use it to cover their tables. It comes in vibrant colors and designs and once she fell in love with every new bag design she created. Great for shopping or a quick trip to the beach. Pockets, no pockets, magnetic closures, long or short handles, and some of her designs are reversible! Her most popular design below is the large market tote. Meredith also does custom bags. In the past she has done canines and equine training treat bags. Follow her on Facebook to see her latest designs. You can see her bags in person the next two weekends in Gig Harbor at Winterfest and then Tidefest. Starting Friday you can now find Beadware at Ventures in Pike Place Market! This unique and inspiring gift store is the "retail incubator" of Washington C.A.S.H. (Community Alliance for Self-Help). Their stores showcase handcrafted products from their program’s participants and other local and low-income entrepreneurs, offering direct market access as well as hands-on training in retail product development, pricing, and presentation. Working together, they are committed to the growth of small businesses, stronger communities, and brighter futures throughout the Puget Sound region and beyond. The first location is in the historic Seattle Pike Place Market at 1st Avenue and Pike St. on the Mezzanine Level, under the main arcade, in Suite 521. Easy directions are to start at the pig, walk down past the fish tossers and hang a right! The second location is a retail kiosk in Concourse C at Seatac International Airport. They have a nice selection of art and gifts, many from friends of mine such as Kaleidescapes, Eastern Wind Glass and Echo Artworks. 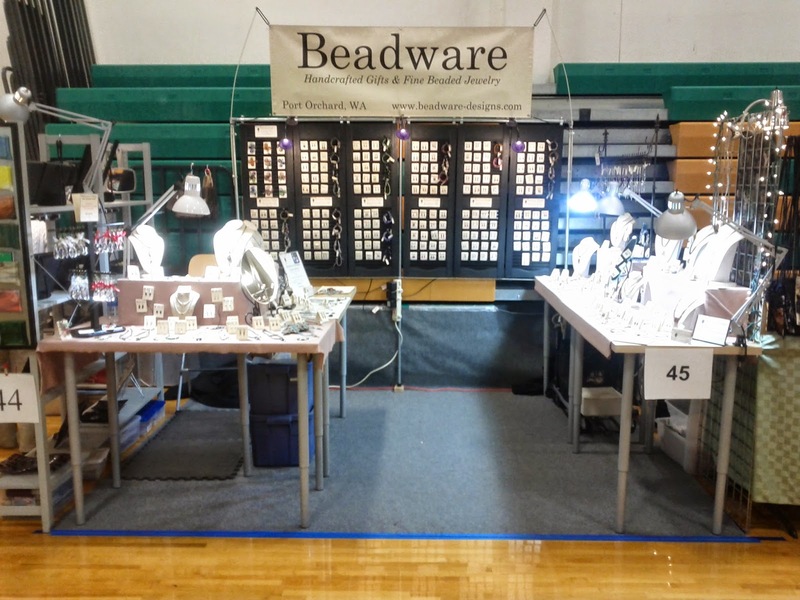 They will have 2 dozen Beadware stone necklaces and several dozen earrings available. I will post a picture of the display as soon as I receive one. As you are out shopping locally this season you will need to get some nourishment to get you through the day. Why not try Monica's Waterfront Bakery and Cafe in Old Town Silverdale! They support local and/or organic suppliers when ever possible to create their yummy menu. My absolute favorite is the crab and asparagus quiche. Check out their website for hours and daily menu. 1) Buy Local -- Support yourself: Several studies have shown that when you buy from an independent, locally owned business, rather than a nationally owned businesses, significantly more of your money is used to make purchases from other local businesses, service providers and farms -- continuing to strengthen the economic base of the community. These include case studies showing that locally-owned businesses generate a premium in enhanced economic impact to the community and our tax base. 2) Support community groups: Non-profit organizations receive an average 250% more support from smaller business owners than they do from large businesses... I know that we are asked for donations daily, if not multiple times a day, and our charitable giving policy is a donation matching program that allows us to say yes to nearly everyone who asks. That is huge! 3) Keep our community unique: Where we shop, where we eat and have fun -- all of it makes our community home. Our one-of-a-kind businesses are an integral part of the distinctive character of this place. Our tourism businesses also benefit. “When people go on vacation they generally seek out destinations that offer them the sense of being someplace, not just anyplace.” ~ Richard Moe, President, National Historic Preservation Trust. This means us, too, with 'Staycations' always becoming more popular. 4) Reduce environmental impact: Locally owned businesses can make more local purchases requiring less transportation and generally set up shop in town or city centers as opposed to developing on the fringe. This generally means contributing less to sprawl, congestion, habitat loss and pollution... many of you know that we offset our carbon emissions through our Carbonfund.org partnership, and we practice what we preach by sourcing from locally owned suppliers and producers for most of our needs. We recycle, re-use and have reduced waste through conservation and good practices across the board. 5) Create more good jobs: Small local businesses are the largest employer nationally and in our community, provide the most jobs to residents. The more successful we are the more people we can employ directly and contractually. 6) Get better service: Local businesses often hire people with a better understanding of the products they are selling and take more time to get to know customers. ... and I want to add that whether or not this is true for the businesses you frequent, it is almost always true that locally owned businesses are usually intimate enough that you can go to the owner with any problem and have it addressed immediately. We certainly value all feedback and respond to everything we find on the internet, though we appreciate those who come to us directly, either in person, through email or on the phone, and really give us a chance to fix it when we mess up. We are human after all, and we make mistakes. However we don't always realize those mistakes until someone lets us know about them, and we always want to learn from them and improve. Every 'complaint' is actually the gift of an opportunity to make it right and learn from it! And that attitude helps us build relationships with those in our community. 7) Invest in community: Local businesses are owned by people who live in this community, are less likely to leave, and are more invested in the community’s future. We belong to many local organizations, co-ops, volunteer, donate, and serve on several committees and boards. 8) Put your taxes to good use: Local businesses in town centers require comparatively little infrastructure investment and make more efficient use of public services as compared to nationally owned stores entering the community. 9) Buy what you want, not what someone wants you to buy: A marketplace of tens of thousands of small businesses is the best way to ensure innovation and low prices over the long-term. A multitude of small businesses, each selecting products based not on a national sales plan but on their own interests and the needs of their local customers, guarantees a much broader range of product choices. This means the more you encourage small businesses the more small businesses will be able to grow and thrive in our community. 10) Encourage local prosperity: A growing body of economic research shows that in an increasingly homogenized world, entrepreneurs and skilled workers are more likely to invest and settle in communities that preserve their one-of-a-kind businesses and distinctive character. Have someone on your list who dresses up for renaissance fairs, attends events like Fairy Con or loves Halloween? Then this is the artist for you. 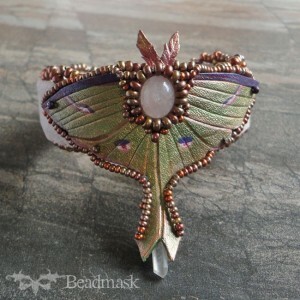 Beadmask creates the most stunning and wonderful sculpted leather masks, wings and crowns, hair toys and fine beaded cabochon jewelry. Andrea has been making masks since 1991 and her work has reached an amazing level of artistry. Her work has been commissioned by dance and theatre companies across the country. Visit her website to learn about the creation of her art. There are also oodles of photos of her work and you can shop! Is wall art or a calendar on your holiday gift list? Is someone on your list a birder? If so then you need to check out McCrain Photography. Phil and Jody McCrain share their love of the birds and the joy of observing and learning new things about the many different species they encounter. In their pursuit of photographing birds they find breathtaking beauty in scenery and wildlife, which they also capture and share. Their passion is to telling the stories of the birds. Their primary tools are a 600mm lens, digital camera and tripod. Back in their studio they review the images, select the best, and print out proofs. Often only one of every couple hundred images is printed. After seeing the images printed, even more are eliminated. From those images that make the cut they decide on the best presentation. This is where Jody's creative vision comes to play. The process of selecting the best cropping, printing surface, and matting to enhance the individual image and highlight the features of the art can often take them hours to agree on. Final prints are printed on an Epson professional printer using archival quality inks and papers. They hand cut the mats, mount the images on sturdy foam core backing board, and package them. The canvas prints are also printed on the Epson printer. After they cure, three to four coats of a protective sealant are hand applied. Once this is cured, the canvas is stretched to the finished gallery wrap piece. Phil and Jody take great care and pride in creating quality pieces of artwork. The result are pieces of art that you will be proud to hang in our home or to give as a gift. "Have fun and keep on sailing!" 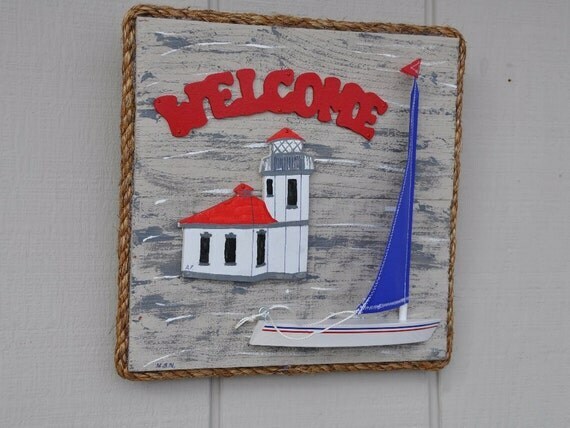 Today's featured artisan is Dog Gone Sailboats in Brinnon, WA. Mike creates unique one of a kind wind driven sailboat whirly-gigs in four different styles from hard and softwoods. 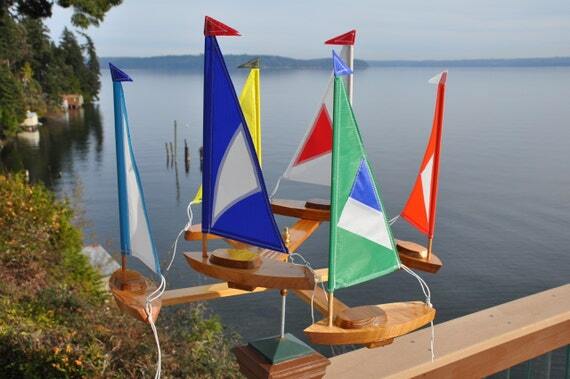 In addition he creates small and large sailboats for the kids to play with in their favorite water area. Dog Gone Sailboats also has packages of boats for weddings, birthdays or just about any special occasions. New for 2014 - Working Sailboat Kits (with weighted keels), (3) boat whirly-gigs, and Sailboat Weather Vanes. 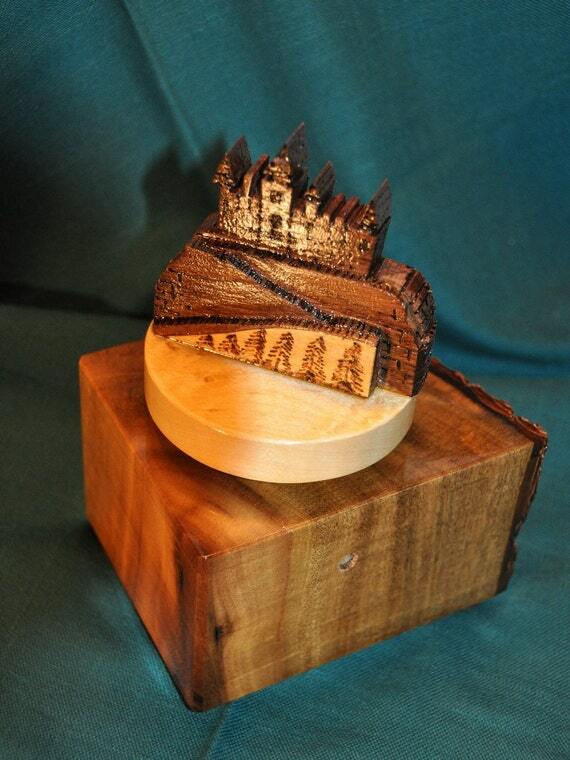 Another recent addition to his products are fine musical wind-up boxes. Mike uses clear fir, cedar, cherry, mahogany, black walnut and spalted western maple. The sails are made from real sail cloth used on big sail boats. The sails come in a myriad of colors and patterns. Most of the hardware is brass and pieces are finished with durable spar urethane. 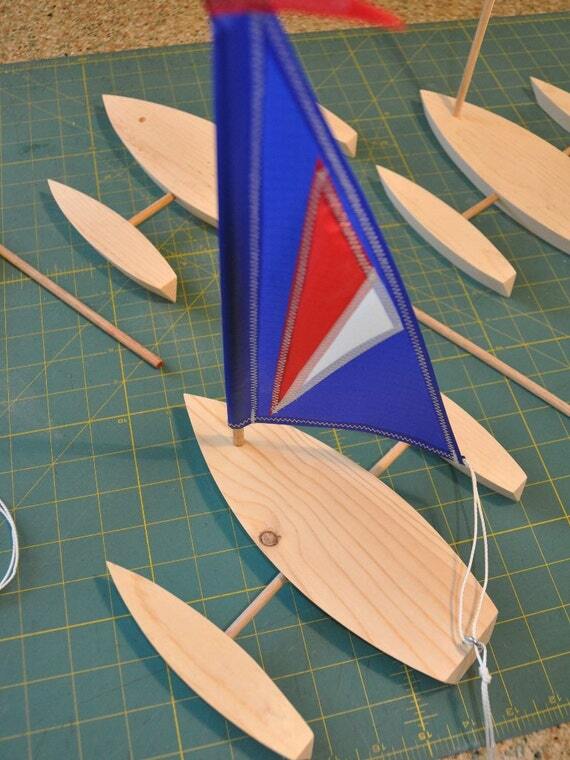 Sailboat kits are available for the young and young at heart! 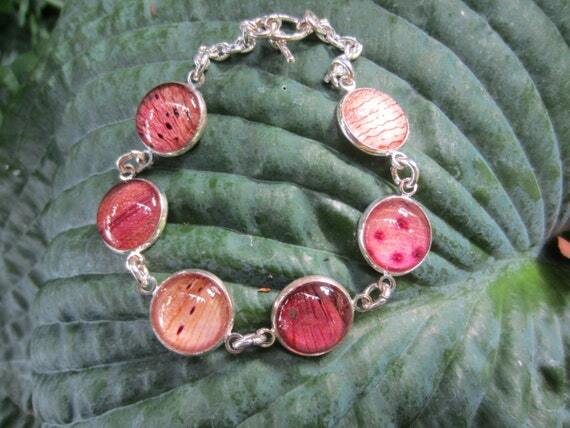 Featured today is Indianola artisan Corena of Corenas Creations. She fashions luminaries sculpted of handmade and recycled paper, fibers, wax, and other organic materials. Corena says that they are the result of an inspiring dream. The luminaries are intended to be enjoyed using a tea-light candle in a glass holder,which creates a beautiful illumination. As with any candle never leave burning unattended. For the winter season she also creates to most adorable snowmen luminaries and ornaments. I can not look at a snowman with out smiling! How about you? The ornaments are also created from handmade paper and wax. The arms are real sticks, the nose is made from clay. Each one is sculpted individually, you will notice that each of them have their own little personality! He or She can be illuminated by a battery operated tea light or from the twinkle lights that are on the tree. Its really fun to group several snowmen together and create a little family amongst your other holiday and winter treasures. You can imagine how much fun it is to make them! Corena's work can be found at many local shops and galleries including Chuckanut Bay Gallery, Pine Cone Gift Shop in Kingston, Quite Light Candles in Stanwood, Wide Mouth Frog in Poulsbo, Nash's in Sequim. She also frequents the Kingston and Everett Farmers markets. This weekend you can find her, along with myself and many other regional artisans, at the Bremerton Gift and Food Fair. 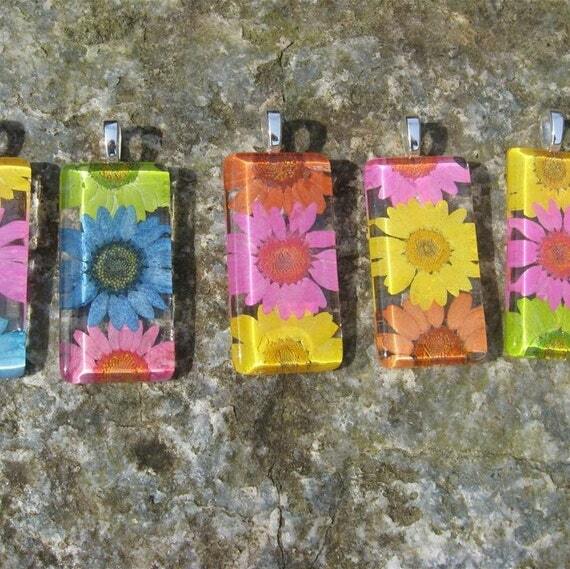 Todays featured artisan is Kathryn of Botanical Creations. Her work would make a perfect gift for a gardening friend or a special someone. Kathryn's love of flower gardening in the Pacific Northwest has segued into a passion for designing and crafting botanical creations – jewelry, cabinet knobs, and other items handmade from pressed flowers and greenery. 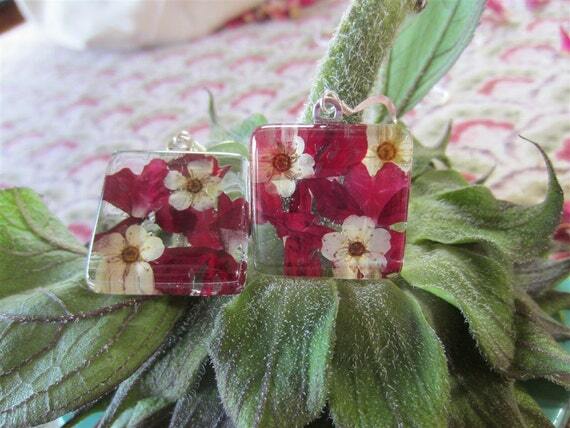 Her designs use pressed flowers behind glass (not resin or plastic). She enjoys harvesting and pressing things from her amazing gardens, then letting her imagination run wild. She lovingly creates each piece, from initial materials to finished product. Most of her creations come out of my own yard, but she has also used flowers and leaves from friends’ gardens across the country. Lily and tulip petals charm bracelet. Being a very generous soul, Kathryn often donates a percent of all her sales to worthy organizations such as World Vision, a humanitarian relief and development organization that helps children, families, and their communities in over 100 countries: http://www.worldvision.org. Another recipient recipient of her efforts is the mission group www.forwardedge.org. Cherry red verbena and bridal veil spirea with sterling ear wires. This spring you will find Botanical Creations at the Northwest Flower and Garden Show. I will post more about that closer to the date. Today I get to feature...me! Here are a few designs fresh off my work bench. You can see them in person at one of my upcoming shows. This is the last of my Flower Jade series. When I began working with these stones I had no intention of mixing them with pearls, but the stones had other ideas!